The Wilton Manors location of Bodytek Fitness is nestled snugly between a performing arts theater and an architectural firm along the N Dixie Highway fork connecting to NE 24th Street. The mirrors lining the interior are enough to inspire a Flashdance fantasy. Abandoned circular balance trainers, trampolines, towers of aerobic steps and stretches of exercise mats straddle the outskirts of the gym floor. Bold splashes of lime green paint on the walls brighten the space in the same way owner Mikey Verdugo does. The 41-year-old fitness expert radiates with energy, buzzing around the gym like a kid in a candy store. This location is a far cry from the humble digs where Bodytek was born. Five years ago, Verdugo started Bodytek in his 20’ x 20’ garage. Outfitted with a punching bag, free weights and a rowing machine among other equipment, Verdugo began embarking on an exciting journey that would yield unexpected success in no time. Within four months of setting up shop, 40 to 50 cars a night were crowding the streets around his house. Along with his new clients came calls from the bank, code enforcement and complaints from neighbors. Instead of crumbling under the weight and pressure of a burgeoning fitness empire, Verdugo buckled down and thought bigger. He opened the Davie location of Bodytek soon thereafter in a 1200-square foot warehouse. To the shock of close friends, Verdugo opened up the second location in Wilton Manors for the bustling fitness brand a month later. Before Verdugo became the toast of the SoFlo fitness universe, he was a cop for nearly a decade and also had his own staging and interior design company. For Verdugo, who has spent most of his life in or around the fitness industry, making the transition into owning his own fitness brand was simply par for the course. Not long after finding his footing in Wilton Manors, this love of fitness motivated Verdugo to further expand Bodytek in his hometown. Although he grew up in Miami, Verdugo admits that he never spent much time in the trendy Wynwood district. After spending time in the area, he fell in love with its vibe and decided to set up shop there a year and a half ago. Much like his other locations, Bodytek Wynwood flourished. Verdugo has since revisited the Davie location and doubled the location in size. Despite such rapid growth in such a short amount of time, Verdugo isn’t in a rush to completely franchise Bodytek out just yet. Bodytek Fitness prides itself on helping clients reclaim their lives by providing intense, exercise-based health and fitness programs. Through specialized training and networking, Bodytek has crafted a community of support that has attracted patrons from all over Florida. Over the years, Verdugo has amassed an intensely loyal following from clients of all different walks of life. South Florida is littered with gyms, each with some heaving, hurculean head turner as their spokesperson. Verdugo is quick to point out that all gyms aren’t created equally and Bodytek has managed to not get lost in the sweaty shuffle. The Bodytek workout consists of consistently shocking the body and muscle memory through an ever evolving routine. No workout is ever the same, as trainers switch things up. One day, clients could very well be bouncing around between 15 different stations completing short intervals. The next, there may be six stations with longer training intervals and more reps. The changing format and fitness formula is a trademark of the Bodytkek workout. While patrons come for the incredible workouts, they return for the exemplary customer service. In a short span of time, Verdugo has expanded his brand to three locations with more on tap for next year. In January 2016, he is slated to launch an Aventura location followed by one in Boca. Bodytek is also hosting Battlefrog in November. The eight-mile run riddled with 30 to 40 obstacles is a team-building event that brings clients together outside of the studio. Ambitious and driven, Verdugo has overcome a surfeit of challenges by sticking to his guns and practicing what he preaches. It’s his clientele, however, that keeps him going in a business that he’s been in since he was an adolescent. As of late, it seems that everyone wants to look good and have that “summer body.” Well, our trainers at Bodytek Fitness are here to give you a wake-up call and remind you that we live in South Florida, peeps, and summer bodies around here are considered a year-round situation! Here are some awesome workout tips and exercises that take place during our HIIT Training sessions found throughout all Bodytek gyms in South Florida. We dare you to accept the challenge and watch your belly fat diminish with these four awesome abdominal workouts. For more information on how to score a free training session, feel free to stop by any of our three South Florida Bodytek Fitness locations in Davie, Wilton Manors and/or Wynwood. Plank: Place forearms on the ground making sure that your elbows are directly below your shoulders and arms are parallel to the ground at shoulder distance. Straighten your back and keep abs contracted, hold this pose for 1-2 minutes or longer and repeat. 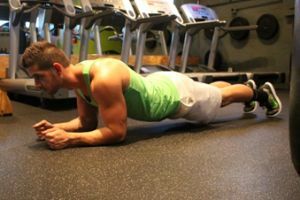 Ab Roller: Hold an Ab roller in front of you with both hands and knees in push-up position (this will be your starting position). Slowly roll the Ab roller straight forward, stretching your body in a straight line. For optimal results, go down as far as you can without touching the ground, keeping your core tight by inhaling. Roll yourself back towards your knees and exhaling on the way back. Perform 3 sets of 8 reps. Sit & Throw: While sitting down, knees bent in a sit-up position about three feet apart from a wall or your Bodytek workout partner, place a medicine ball midpoint on your chest. Now, as you crunch up into a sit-up throw the ball towards your partner in a two handed chest pass. Your partner should then send the ball back to you in a parallel direction. This will place you catching the ball over your head, and recoiling back into a sit-up position. Repel the ball back as quickly as possible. Perform 3 sets of 8 reps.
Russian Twists: Lie on a mat with knees up like in crunch position, both feet under something that will not move or have your Bodytek partner hold them down for resistance. Elevate your upper body so that it creates a V-shape with your torso and thighs (this is your starting position). With just your own body weight or with added resistance such as a dumbbell, twist your torso diagonally to the left so that the dumbbell is parallel with the floor and on the side of your hip. Now move in the opposite direction performing the same steps for the right side. Make sure to keep your core contracted and back straight. Repeat exercise in 3 reps of 8. Don’t forget these helpful tips! • Drink a ton of water! Not literally of course, but you should increase your water intake to about 1-1.5 gallons daily. This helps to flush out any fatty toxins out of the body and most importantly keep you hydrated during your Bodytek HIIT Training. • Watch the Sodium to avoid bloating! The American Heart Association recommends you consume no more than 2,400 milligrams of sodium daily — roughly 1 teaspoon of table salt. That’s enough sodium to replenish your supply even if you work up a major sweat.